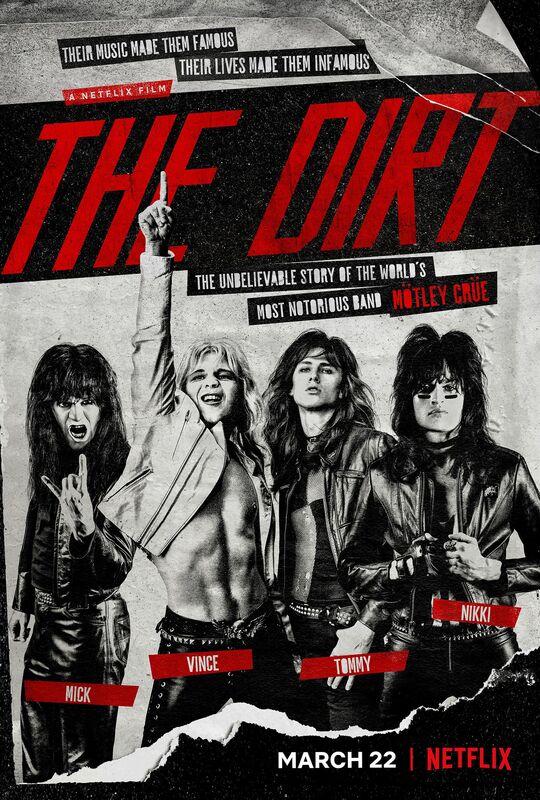 With The Dirt now streaming on Netflix, I recently sat down with director Jeff Tremaine to talk about making his Mötley Crüe movie. If you haven’t seen the trailers, the film is an adaptation of the of the 2001 memoir The Dirt: Confessions of the World’s Most Notorious Rock Band, which was co-written by the band and Neil Strauss. The film follows how Mötley Crüe first formed, features plenty of wild nights in the 1980s, and chronicles the group’s rise to become one of the world’s most famous heavy metal bands. Douglas Booth plays Nikki Sixx, Colson Baker plays Tommy Lee, Iwan Rheon plays Mick Mars, and Daniel Webber plays Vince Neil. The film also stars Pete Davidson as Tom Zutaut. During the interview, Tremaine talked about his long history on the project, why he wanted this to be his first narrative feature, how he decided which Mötley Crüe songs and stories to use in the film, if the film changed a lot in the editing room, whether they thought about making a miniseries or something other than a feature with the material, if Netflix might release any delete scenes or a commentary, and more. In addition, Tremaine explained why he decided to prank his director of photography every day on set by pretending it was his birthday. How he’s been thinking about making The Dirt is 2002 and when he was making the first Jackass movie. How Netflix stepped up to make the movie. How did he decide which songs to put in the movie? Why Livewire become the young days anthem in the film. How did he decide what to focus on in the film when you have so many crazy stories to pick from? Did they ever think about making the project as a four-part miniseries or something other than a feature? How did the film change in the editing room? Has he asked Netflix about releasing any of the deleted scenes or a commentary? Why did he decide to have his director of photography have a birthday every day of filming?